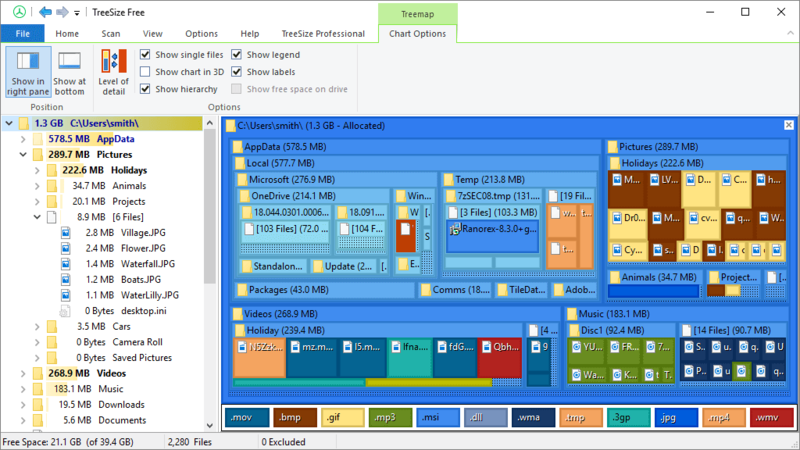 TreeSize Free is a Windows disk utility that tells you where your disk space has gone. In this age of video downloads, games and applications that eat up gigabytes, you might be surprised at how quickly these can gobble up your hard disk space. With this free application from Jam Software you won’t have to worry about this at all. Once this program has been installed, you can start it from the context menu of a drive or folder. This will reveal the size of the folder and the sub-folders. You can expand the folders in a manner that is similar to Windows Explorer, allowing you to see the size of all the sub folders. In fact all the results may be drilled all the way to file level. It is also worth noting that the scanning operations operate in a thread so that the results are visible even as the program is running. The Explorer context menu is supported in the software. In addition to this, it supports drag and drop for more convenient operations. This disk space utility is also capable of displaying compression rate of NTFS and put the NTFS compression to work on all the directories. You can also run TreeSize as an admin and determine the sizes of folders that are usually hard to access. Unlike other software, Windows security is not affected. TreeSize Free is not just easy to use but a breeze to install as well. All you need to do is follow the instructions and if you want to uninstall it, you can do it via the Windows Control Panel.